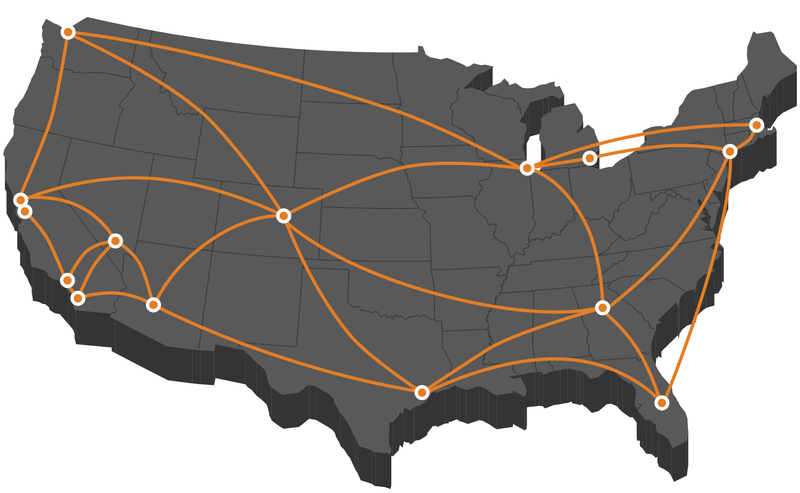 Fiber-optic Gigabit Ethernet circuits are becoming increasingly common in many U.S. venues. Some venues (and their in-house Internet service providers) take advantage of meeting planners by charging exorbitant markups when they resell their existing bandwidth. Since our fiber-optic circuits are already installed at many venues, we can switch them on and off with just a few days’ notice, often at a fraction of the traditional cost. 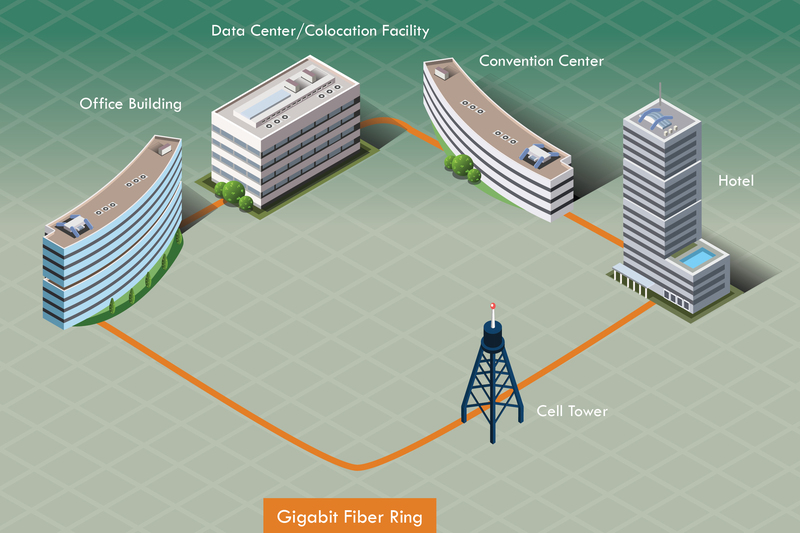 Gigabit Ethernet, or "Gig-E" for short, is ultra-high capacity IP transit service offered to enterprises around the world by way of a fiber-optic cable that forms the backbone of the communication link between the carrier and the end-user. The word "Gigabit" refers to the capacity of the link, which is 1,000 Megabits, or 1 Gigabit, per second. Typical latency on a Gigabit fiber network is less than 10 milliseconds, making it ideal for every Internet application including live video streaming, file sharing, mobile apps, VoIP, VPN, email, and web surfing. When fiber-optic Internet providers install circuits at venues, they often lay extra strands (called dark fiber or unused fiber), leaving excess capacity for future customers. If your event takes place at one of our fiber-lit on-net venues, we can provide fiber-optic bandwidth on a short-term basis. Your Trade Show Internet account rep will work with you to determine your event’s bandwidth needs and provide pricing options for various speeds from 100 Mbps to 10 Gbps. Once a contract is signed, we’ll activate your circuit at the MPoE/MDF (primary telecom room), specify the type of fiber (single-mode or multimode) and connector type (SC, LC, or RJ45), and provision your circuit’s IP settings. What you do with your bandwidth circuit is up to you. Some customers provide their own core router/firewall and install their own local area network (LAN). Other customers will hire their venue’s IT vendor to provide this service. Trade Show Internet offers a full suite of Event IT and Event WiFi solutions. Our network engineering team can come on-site to monitor your bandwidth, route the circuit to all functional areas of the event space, partition the bandwidth by setting up VLANs, provide wired Ethernet drops, and deploy a high-density WiFi network for staff, attendees, and exhibitors. Your Trade Show Internet account rep will work with you to determine your event’s bandwidth needs and provide pricing options for various speeds. If your event takes place in a hotel or convention center, and you are looking to circumvent the in-house ISP, you must negotiate the right to bring in your own bandwidth circuit before signing your venue lease agreement. By removing Internet/telecommunications exclusivity clauses, you can gain valuable negotiating leverage and tilt the balance of power in your own favor. To further reduce Internet costs, you should request a list of all associated venue fees in advance. Many of these fees are negotiable, including electrical, MDF/IDF closet access, fiber cross-connect, copper cross-connect, port access, patch panel, Ethernet drop, roof access, gear storage, and labor supervision. Don’t know what some of these things are? No problem, we can help guide you through the process. Don’t see your venue on our list? We may still be able to meet your event bandwidth needs with our point-to-point bandwidth solution, satellite bandwidth solution, or bonded 4G Mega Internet Kit rental solution. Contact us today for a no-obligation quote.